Placa negre amb franja ample marró/daurat. 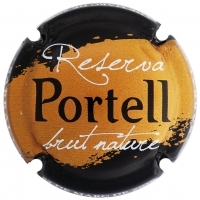 Centre text, "Reserva - brut nature" blanc i "Portell", negre. Black plate with fringes wide golden/brown. Centre text, "Reservation - dirty *nature" white and "Porthole", black.